Schlock-Wire: Full Specs For Scream Factory’s THE TEXAS CHAINSAW MASSACRE 2 Collector’s Edition – Schlockmania! The buzzz is back! 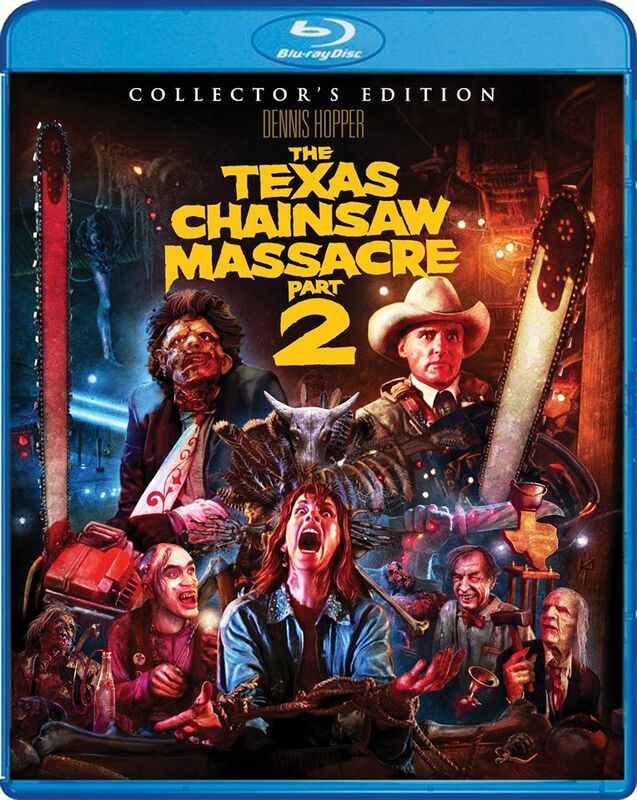 On April 19, 2016, Scream Factory will release The Texas Chainsaw Massacre 2 [Collector’s Edition] in a comprehensive 2-disc set with 10 hours of bonus features, including nearly 5 hours of exclusive content. In 1974, horror fans rejoiced upon the release of Tobe Hooper’s masterpiece, The Texas Chainsaw Massacre. The movie raised the stakes of in-your-face filmmaking and changed the face of horror. Twelve years later, Tobe Hooper and the Sawyer clan are back with this deviously entertaining sequel, starring Dennis Hopper in one of the most deliciously crazed performances of his career. For a decade, Texas Ranger Lefty Enright (Hopper) has sought to avenge the brutal murder of his kin by the cannibalistic Sawyer family – Leatherface, Chop-Top, The Cook and Grandpa. With the help of a radio DJ (Caroline Williams), who’s also bent on putting an end to the terror, Lefty finds his way to the Sawyers’ underground slaughter shop, where a battle of epic proportions will soon rage… and the line between good and evil gets chopped to bits! Next ArticleTHE CURSE: Down-Home Lovecraft?